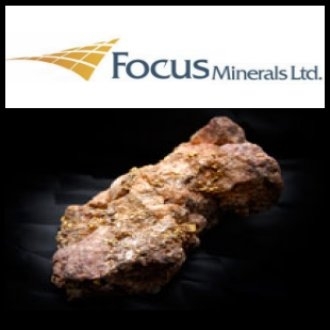 Perth, April 11, 2012 AEST (ABN Newswire) - Focus Minerals Ltd. ( ASX:FML), a leading Australian gold producer and explorer, has produced 47,489oz1 of gold for the March Quarter -- a 28% increase on the December Quarter. Chief Executive Officer Campbell Baird said the growth was due to an improved performance from its recently acquired Laverton operations and ongoing, consistent output from its Coolgardie mines. Mr Baird said the March Quarter production numbers underlined Focus' growing status as a major Australian gold producer. "We are delivering strong production growth. On a quarterly production basis we are among the top tier of Australian gold producers," he said. Focus' Laverton operations delivered 25,636oz1 from its tenth ore processing campaign at the Barrick Granny Smith mill, a 50 day processing campaign. Production from the Coolgardie mines was 21,853oz as forecast, and in line with the preceding Quarter. "We are on track to deliver consistent, stable production at Laverton and Coolgardie with operational efficiencies that will enable us to achieve margin expansion at a time of strong gold prices," Mr Baird said. "At Laverton we have developed three new sources of ore including the Apollo pits and are focused on delivering a structured turnaround. The improvement in performance has resulted from a combination of the number of open pits in operation giving us blended ore sources to maintain recovery and throughput. We completed Campaign 10 with over 150,000 tonnes already stockpiled on the ROM pad at a grade of 1.8 g/t in preparation for the next Campaign in the June Quarter." "At our Coolgardie operations we have also demonstrated our ability to develop and commission new mines, having established two new mines there in the first half of FY 2012 to grow production." Production for the June Quarter is targeted to remain consistent with the March Quarter for both Laverton and Coolgardie. The Laverton processing campaign at Barrick Granny Smith is scheduled to be 41 days but with mining from higher grade ore zones to sustain stable production. Gold production for Focus Minerals in the December Quarter was 37,098oz(1). (1) Based on 100% of Laverton production. Focus owns 81.57% of Crescent Gold Limited and Focus' interest in Laverton production is therefore pro-rated accordingly.